Energy efficiency and solar advocates have on occasion butted heads over which option should be implemented in homes and buildings first and how much should be installed before the other is considered. Here at ACEEE we believe that, like market solutions vs. energy efficiency programs, this is a false choice. Both are valuable and can, and should, work together as an integrated solution to create cleaner and cheaper energy. While energy efficiency is just as clean as solar when it comes to emissions, efficiency by itself can’t produce energy for customers looking for a clean energy option, and solar without energy efficiency can’t reach the full extent of its potential. However, in recent years, some solar companies and some consumers have been employing a solar-first strategy in the residential sector—installing solar systems without paying much attention to energy efficiency. This strategy has been spurred in part by substantial solar tax credits, net-metering rules in place in most states, and the availability of solar financing that reduces or even eliminates the initial purchase price, replacing the up-front cost with monthly payments that extend over many years. Despite these incentives, it still generally makes sense to implement as much efficiency as possible when installing generation. To look more closely at this issue, we conducted two illustrative analyses. 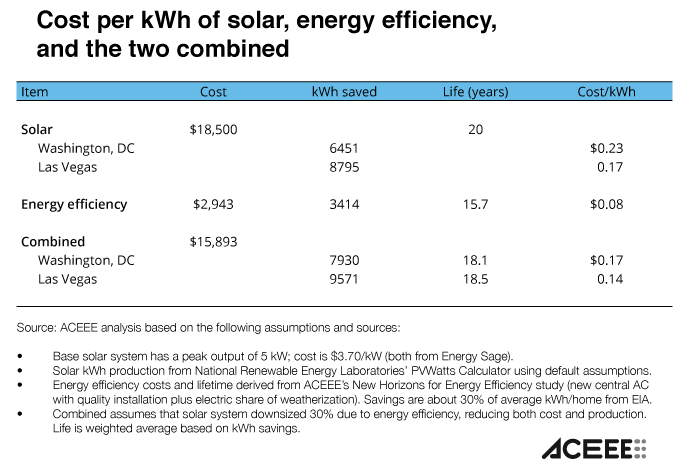 The first compares the cost per kWh produced or saved from solar and energy efficiency when done individually or together. The second compares solar technical potential and residential electricity use, with and without efficiency. We find that when efficiency and solar are implemented in tandem, costs are lower, and solar can meet a larger share of residential loads. For this comparison, we looked at the average cost per kWh produced from a typical solar system today, the average cost per kWh from residential energy efficiency, and the cost per kWh when efficiency and solar are done together. Our results are summarized in the table below. A solar system costs about 17-23 cents per kWh produced (the low-end estimate is based on very sunny Las Vegas, the high-end on Washington, DC). Energy efficiency costs less—about 8 cents per kWh. But when solar and efficiency are combined, the cost is 3-6 cents less per kWh than solar alone. Energy efficiency has a lower cost, and it also reduces the size and cost of the needed solar system. PB&J (solar and efficiency) is less expensive than PB (solar) alone. This analysis ignores the federal 30% solar tax credit and also ignores utility incentives that are commonly available for energy efficiency measures. If tax credits and incentives are included, the overall result is still generally the same—a combined approach is less expensive per kWh than solar alone. This is just a simple analysis for typical measures and hence is only useful as a rough approximation. For this analysis, we compared estimates of the technical potential for rooftop solar systems in each state (as estimated in a GIS-based analysis by the National Renewable Energy Laboratory) with residential electricity use (from the most recent EIA Residential Energy Consumption Survey or RECS). 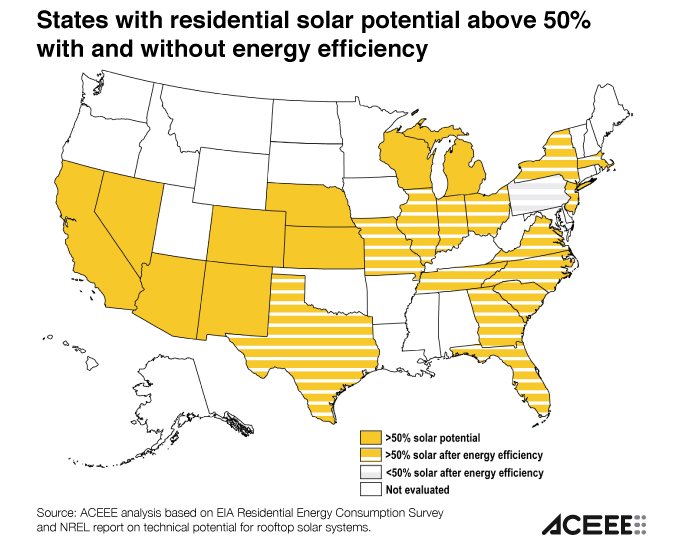 We looked for states where the solar technical potential in the residential sector was at least 50% of current residential consumption, or of residential consumption if energy efficiency were to reduce consumption by an average of 30%. Our analysis only covers 24 states, as those are the states with detailed data in RECS at the single- or two-state level. Results of our analysis are shown in the map below. With efficiency, 23 out of the 24 states could hit the 50% solar threshold, including six reaching 75% solar (California, Colorado, Kansas, Nebraska, New Mexico, and Nevada). Without energy efficiency, only nine of the 24 states could meet at least half of the residential load with rooftop solar. Only in two states (California and Colorado) does solar potential exceed 75% of residential consumption. In other words, solar can meet a much larger proportion of residential loads if efficiency is included. This analysis doesn’t include potential growth in electric loads such as from increased use of electric vehicles, or conversion of gas and oil space- and water-heating systems to heat pumps. Details of our analysis, including a case where all gas and oil space-heating systems are converted to heat pumps can be found here. In this alternative case, only two states meet the 50% threshold without efficiency, while 12 states meet the threshold with efficiency. As with our first analysis, this is a rough analysis that assumes all of the solar potential is achieved and that all homes implement energy efficiency. Also, this simple analysis ignores the fact that some homes can produce more solar power than they use while other homes are not suitable for solar, such as those heavily shaded by trees or that do not face south. This analysis should be considered a yardstick and not a definitive analysis. Energy efficiency will generally be less expensive per kWh than solar. And by lowering consumption, energy efficiency will stretch the available rooftop solar resource farther, allowing solar to serve a higher percent of residential consumption while also allowing a smaller and less expensive solar system. These are two simple analyses but they make a clear case that jelly (efficiency) is needed to help peanut butter (solar) do its best.